Photos by Meg McGrath. For more images, visit McGrath’s late blight photo gallery. ITHACA, N.Y. — Last year, many broken-hearted gardeners in the Northeast were denied their cherished homegrown tomatoes when late blight – the same disease that triggered the Irish potato famine – wiped out their plants. “Anyone growing susceptible plants needs to take responsibility to ensure they don’t become a ‘typhoid Mary,’” says Meg McGrath, plant pathologist at Cornell University’s Long Island Horticulture Research and Extension Center, Riverhead, N.Y. The good news for gardeners is that they are starting with a relatively clean slate this year. 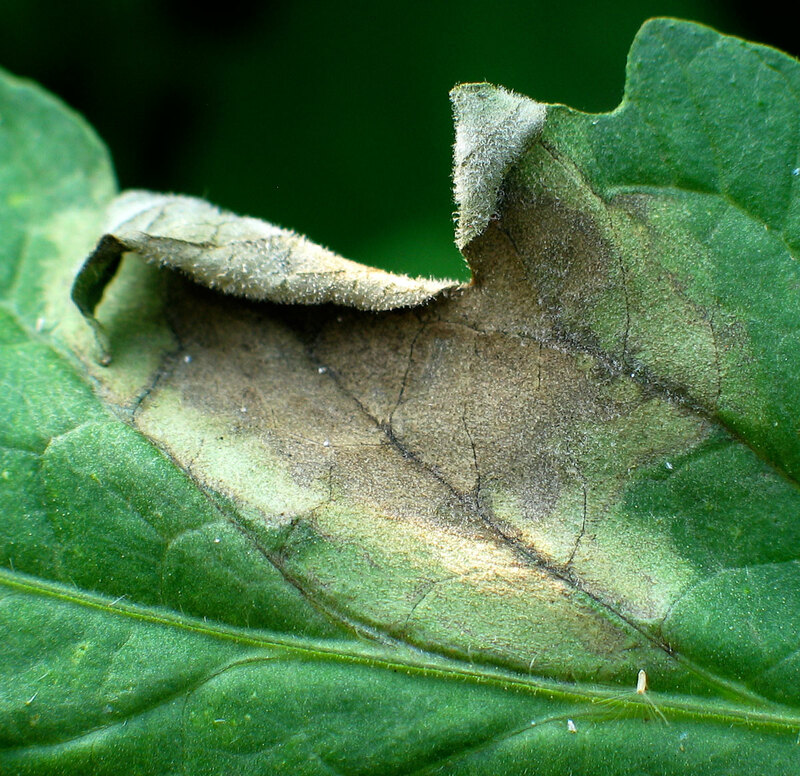 Phytophthora infestans, the fungus-like pathogen that causes late blight in tomatoes, potatoes and other tomato-family plants (Solanaceae), currently requires living plant tissue to survive overwinter in the Northeast. That’s why the disease is relatively rare in the region. Late blight lesion on tomato leaf. Click for larger view. The bad news is, potato tubers are living plant tissue. So any late-blight-infested potato tubers that survived in your soil, compost pile or root cellar could harbor the pathogen and give it an early start again this season. Infested potato tubers are usually the main source of the pathogen in the Northeast, says McGrath. But spores can also be carried by wind into the region from milder climates. Typically, these outbreaks occur later in the season, hence the name late blight. And there is potentially worse news: If both mating types of the pathogen establish here in the Northeast, they can produce thick-walled spores that overwinter and survive several years in the soil without a living host. This has already happened in parts of Scandinavia and Europe, where late blight, as a result, occurs more commonly. While only one mating type was detected in the Northeast last year, both types appear now to be established in Florida. 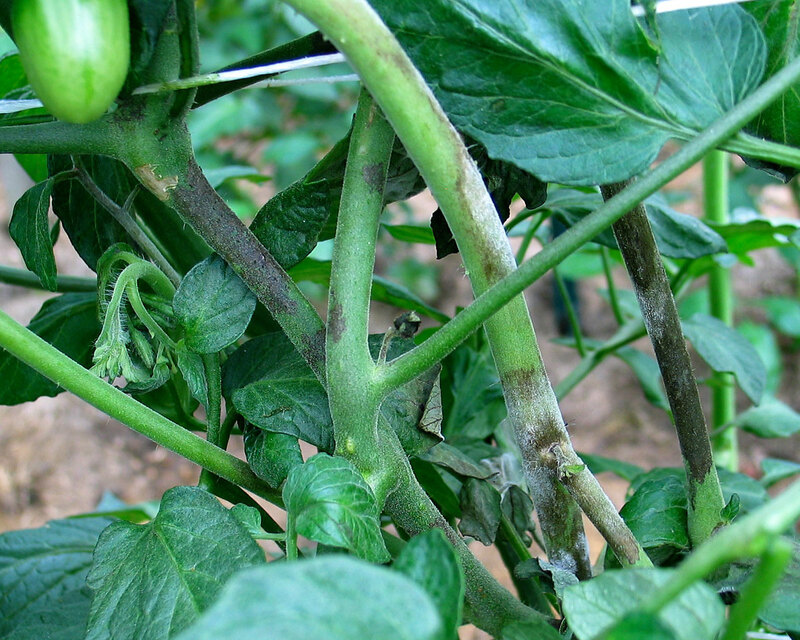 Even though late blight cannot yet survive in the Northeast without a living host, it’s still a good idea to rotate crops and clean plant stakes and tomato cages to help prevent other diseases, suggests McGrath. 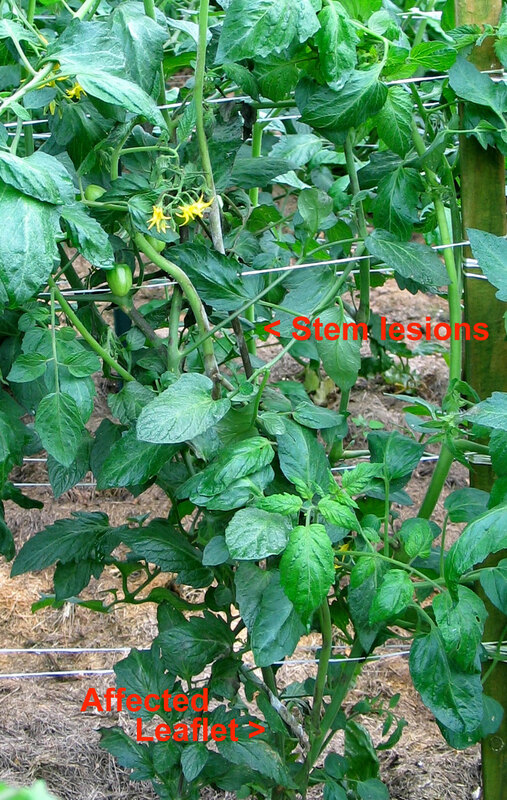 A range of symptoms on tomato stems from the small, irregular spots found early on to larger lesions to white spores formed under moist conditions. One line of defense against plant diseases is to choose varieties that have some resistance to the disease. Researchers at North Carolina State University have developed two promising tomato hybrids – ‘Mountain Magic’ and ‘Plum Regal’. Both have excellent resistance to several strains of late blight. But seed of these hybrids is not expected to be widely available until 2011, says Tom Zitter, a vegetable disease specialist in the Department of Plant Pathology and Plant-Microbe Biology at Cornell University, Ithaca, N.Y.
Zitter has summarized observations and research on the late blight resistance of certain tomato varieties to strains of the disease that recently plagued the Northeast. (See chart, below.) But even if a variety is resistant to one strain of the disease, that doesn’t mean that it’s resistant to all strains, Zitter points out. While some are better than others, no potato varieties are highly resistant to late blight. Adapted from Performance of Tomatoes for Late Blight (LB) and Early Blight (EB). T. A. Zitter, March 2010. So what can gardeners do to minimize late blight in their own gardens – as well as reduce the chance of spreading it to others? Kill volunteer potatoes. Dig up, bag and trash any potato plants that pop up in your garden or compost pile. It may take repeated efforts to get them all. Buy healthy tomato plants. Learn what late blight looks like. (See For more information below.) If you spot any infected plants while shopping, alert store management and your local Cooperative Extension office, and buy your plants somewhere else. Or you can grow your own plants. (Late blight isn’t spread on tomato seeds.) Start seed about 6 to 8 weeks before your last frost date. Use certified seed potatoes. Don’t use leftovers from last year’s garden or table stock from the grocery store. Keep plants dry. The late blight pathogen thrives in cool, wet weather. That’s because it requires moisture to infect plants, grows best when it’s cool, and clouds protect spores from lethal UV radiation when they are dispersed by wind. Even in absence of rain, the pathogen can infect plants if the relative humidity is 90 percent or more. If plants need watering, water the soil – not the foliage. Sound the alert. If you find late blight in your garden, let your gardening neighbors and local Cooperative Extension staff know so they can warn others and be on the lookout for additional infestations. Make sure your neighbors know how to spot late blight in their own gardens. Dispose of plants properly. To reduce disease spread, remove infected plants during the middle of a sunny day after leaves have dried, if possible. But don’t wait for these conditions. Seal plants in garbage bags and leave them in the sun for a few days to kill plants and the pathogen quickly before placing in the trash or burying underground or deep in a compost pile. Don’t just leave plants on the ground or on top of the compost pile where they will continue to be a source of spores until the plant tissue dies. With a large number of plants, you can build a pile on the ground and cover securely with a tarp until the plants die. Keep an eye on other tomato-family plants. 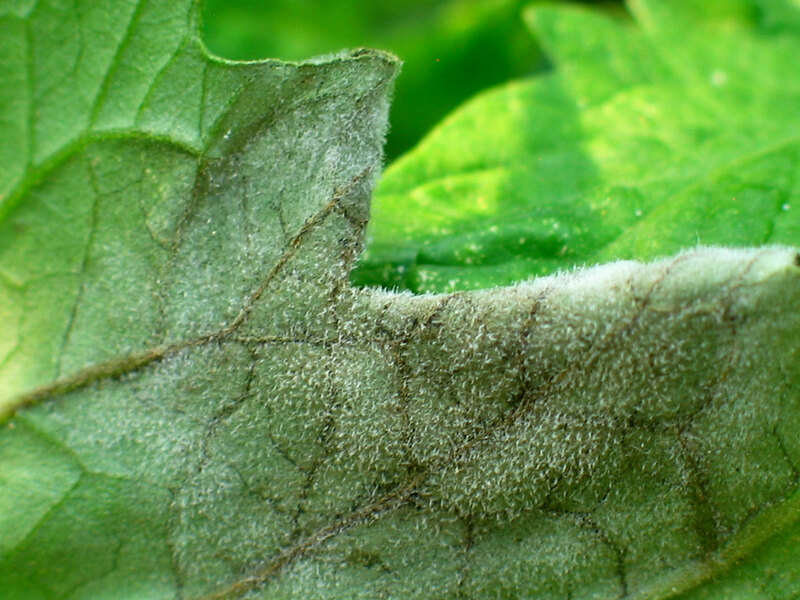 Some strains of late blight can infect other tomato-family plants, including weeds such as hairy nightshade and bittersweet nightshade. Control them early so that late blight on these plants doesn’t go unnoticed. Petunias and tomatillos are also vulnerable to attack. Use fungicides with care. Fungicides can control late blight. (Chlorothalonil and copper-based products are both available to home gardeners.) But if you wait until late blight symptoms appear, it might be too late to rescue plants. For fungicides to work effectively on late blight requires a regular preventive spray schedule and thorough spray coverage. Follow all label directions, including use of respirator, waterproof gloves and protective eyewear. Late blight on tomato – Meg McGrath’s photo gallery includes links to other Cornell resources. Performance of Tomatoes for Late Blight (LB) and Early Blight (EB) – Tom Zitter’s summary of disease resistant variety research.